Ginger is good for health and aids in proper digestion. It is used for both in sweet and non-sweet dishes. Ginger adds a hot yet refreshing flavor to the curries, cakes and biscuits. Ginger also produces a hot and is used as fragrant kitchen spice. Tender ginger is juicy and fleshy with slightly mild taste. Ginger is also often pickled in either vinegar or sherry. They are also added into boiling water to make fantastic ginger tea to which honey is often added.The juice from ginger roots are often used as spice in Indian recipes and is a quite essential ingredient in many Chinese, Japanese and many South Asian cuisines for flavoring dishes such as seafood and vegetarian cuisine. 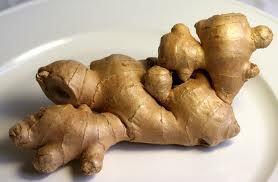 Ginger also acts as a useful food preservative. Ginger can be used in fresh or dried form. Dry ginger powder is typically used as flavorings for recipes that include ginger bread, cookies, cakes, ginger ale and ginger beer. Candied ginger is the root cooked in sugar until soft, and is a type of confectionery. Ginger is refreshing, soothing for colds and sore throat. Allam pachadi is an exceptional and well known innovative pachadi from the Andhra cuisine made with ginger, red chilies, red chili powder, curry leaves, tamarind, and urad dal. Allam pachadi has an excellent sweet, spicy and tangy taste. It is generally served with Idli, dosa, pesarattu or vada. It is a very popular accompaniment to the various and nutritious south Indian breakfast items. 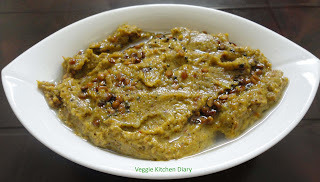 Allam pachadi looks bright, unique flavored pachadi or chutney having a perfect combination of sweet and spice. Prepared from fresh ginger gives an strong aroma and fragrance while making the pachadi. Allam pachadi is a authentic Andhra recipe, simple and quick to prepare. Ginger being the main ingredient in making of this allam pachadi (ginger chutney) is one of the oldest and most popular spices in herbal medicines which are spicy, peppery and strong. Though ginger is the main ingredient in this pachadi, its flavor is not overpowering. The pungency of ginger is perfectly balanced with the sweetness of jaggery and tangy tamarind. With just a punch of tempering with few toasted mustard seeds, curry leaves, spicy red chilies and some protein urad dal in this pachadi makes a great accompaniment to Pesarattu,idlis, dosas and vadas. 1.Grate jaggery and ginger, keep them aside. 2.Wash tamarind with water. Then, soak it in 1/4 cup boiled hot water and keep it for 20 mins. Take out the tamarind paste and keep it aside. 3.Heat Oil in a tadka pan add the ingredients of 1st seasoning.Fry till dals turn light golden brown.Switch off the flame and add grated ginger and green chillies to it. Let it cool for some time. 4.Now,Grind this tempering along with the tamarind pulp,jaggery and salt into a coarse paste.do not add water while grinding. 5.Heat oil for the 2nd tempering.add the gram;as it turns golden,pop the mustard and switch off the flame and add hing.Garnish the Allam pachadi or Ginger Chutney with this crunchy tempering. 6.Serve with Pesarattu,Idlis and dosas.